Russia’s Gazprom has agreed to sell gas to Ukraine’s Naftogaz at a price of $248 per 1,000 cubic meters. The deal is for the next three months, and represents a 25 percent discount on the price during the first quarter of the year. Ukraine has signed a new agreement to buy Russian, the Ukrainian energy ministry said on Thursday. 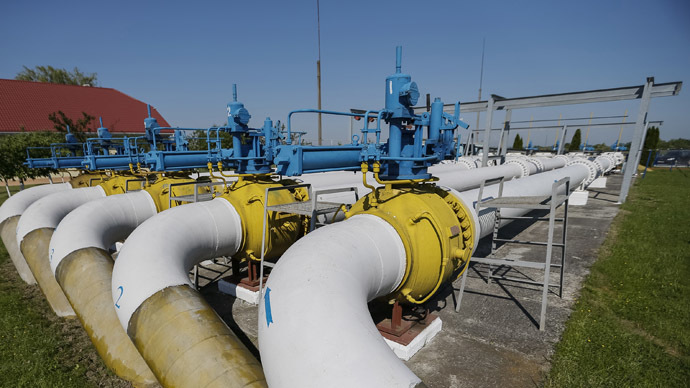 In the first quarter of 2015, Ukraine paid Russia $329 per 1,000 cubic meters of gas. That deal expired on Tuesday, along with the ‘take-or-pay’ clause that requires payment for gas no matter if Ukraine uses it or not. Kiev, under the leadership of Yulia Tymoshenko, and Moscow signed a 10-year gas contract in 2009. "Under the terms of the contract, the gas price will stand at $248 per 1,000 cubic meters. All the other terms totally repeat the terms of the so-called 'winter package'," the Ukrainian Energy Ministry said on its website Wednesday, as quoted by TASS. Originally, Ukraine’s temporary $100 discount was due to expire at the end of March, a provision agreed to in the so-called winter package. The deal was brokered by the EU in October just before the cold weather hit Ukraine, and the European Commission hoped the discount would last a full year, but Gazprom said only 3 months was possible. On Tuesday, Russian President Vladimir Putin and Gazprom CEO Aleksey Miller said that Russia would extend Ukraine’s gas discount through the spring months. On Wednesday PM Medvedev signed a decree that would enable to Kiev to continue with its $100 discount, but only as long as Kiev continues to pay its debt obligations. Neither party has confirmed if Russia’s demand for Kiev to supply gas to the Donbass region has been fulfilled. After Ukraine fell behind on its debt payments to Russia, Gazprom switched to a prepayment regime. Russia previously cut supplies to Ukraine in the winter of 2006 and 2009, and in June 2014. The first two shut offs seriously disrupted European markets.